Today's review brings back the dark angel of death himself, Tarson Meads. If you're always complaining that Scriptshadow only reviews the fluffier fare, well then do I have a blog for you. Tarson not only likes the darkness. He thrives in it. Though I've never actually been inside, I've been told he redecorated his basement to look like the basement from Silence Of The Lambs. Anyway, if you enjoy Tarson's dark sensibility, then head over to his blog afterwards and explore your inner evil. 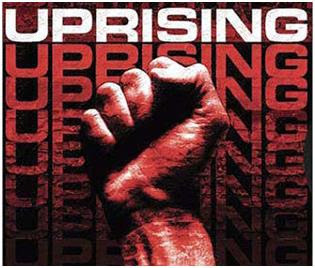 Here's his review of Uprising by David Twohy, which sounds like something I'll have to check out. I loved Pitch Black. The script is almost a perfect example of how to craft a sci-fi action screenplay. But man, that sequel was abysmal. And don't get me started on "Below," that weird submarine flick he directed. Talk about all over the place. Still, when David Twohy does sci-fi, I pay attention. Premise: The story revolves around the resistance efforts of some citizens after Earth has been occupied by a powerful alien race. About: Variety has confirmed that Wolfgang Petersen will be directing Uprising for Columbia Pictures, with Douglas Wick and Lucy Fisher producing through their Sony-based Red Wagon shingle. Like most scripts, this seems to have been rewritten quite a bit. Before Twohy was involved, William Broyles Jr. wrote a strong draft as well. "Come on, men, who's with me?" I’ll gladly confess I’m partial to the odd alien invasion story. I think there’s something that’s both fascinating and intriguing about them, almost on a primal level. It’s a universal theme. Everyone on earth can relate to it. It asks one of the biggest questions: are we alone? The idea of being invaded by forces far more advanced than us, has thrilled generations for over a century, and when you boil it all down, it’s just great entertainment. War of The Worlds might still resonate with today’s Facebook generation, but I’m waiting for the day when I read a solid script that tackles the UFO subject, without being campy, spoofish or prudish. Some of you may have noticed lately, there’s been an increasing trend, both in novels, comics and yes, even screenplays, which explore life on earth, post alien invasion. Anthony Peckham’s spec “No Man’s Land” was an honorable effort, even garnering some votes on 2007’s Black List, but since that script, there’s really been nothing of interest, or of significance in the alien invasion genre. At least not to my knowledge, screenplay wise. I’m happy to report, the script is extremely good. Twohy just wipes the floor with this. He’s managed to not only write a compelling story, but do it with such imagination; it honestly makes me wonder why I bother trying to be a screenwriter, when this guy is just so good. Uprising clocks in at 136 pages. Now for the jaded reader out there, that’s bad news. But I can’t tell you how long it’s been where a script has grabbed me from start till finish. Some scripts take me days, even weeks to trawl through, but this was sheer entertainment. The story takes place in and around a human POW camp, where a brutal alien race, called the Druuben, have conquered earth. There’s no military, no Government, just the Druuben. They now run earth, and it’s not a pretty sight. Those who are lucky enough to avoid the camps, dwell in complete squalor. There’s human life, but it’s the pits, man. Basic services are next to non-existent, and humanity is being forced to live the Druuben way. They are here to rebuild earth in their image. Kids are even being forced to learn the Druuben tongue. It’s clear Twohy invested a lot of thought into designing the Druuben, and one of the things I loved about them, is that they’re not simply merciless overlords. They’ll indirectly bargain with humans, as long as it benefits their cause. Throughout the story, we catch glimpses of their social structure, their culture and their language, and it makes us hate them even more. It’s also clear; they’ve done this invading business many times before. The Druuben themselves are only partially revealed to us in quick glimpses. Twohy teases us, and rightly so, because like our enslaved human brothers and sisters, we dare not look at them. Once revealed in full, the Druuben are shockingly grotesque and completely alien. For starters, they don’t have eyes. They see radio. That’s right, radio frequencies, which also explains how they were able to coordinate a global attack with such efficiency. It’s like organic range-finding. Moonless night? No problem. Snowstorm, heavy rain? Cut right through it. They might even have the ability to see with the back of their heads. They’re scanning and frequency hopping, tuning their built-in radio dial, finding the wavelength that will best resolve their target. No, just because they don’t have eyes, doesn’t mean they can’t see. It’s the little things like this that make Uprising so much fun, and render the Druuben as truly terrifying oppressors. Okay, so enough about aliens. What about our characters? What about the plot? This is after all, a screenplay, right? So after the opening attack, we meet our hero Lieutenant J. Stevens, a US Naval officer. Twohy likes to write tough guys with attitude. Stevens oozes “action hero guy.” He’s not afraid to go head to head with the Druuben and risk his life. Not afraid to cut a deal with the Druuben, so us humans can have the right to bury our dead. And just like the title suggests, Stevens is responsible for initiating an underground movement inside the camp - an uprising. Under the cover of darkness, he develops a plan to not only escape, but play the one final card humanity has against the Druuben. What is it? You’ll have to read it to find out – but it’s something the Druuben suspect is out there. Something they may have missed. Something that could turn the tide. Something the Druuben fear. Okay, I’m going to stop right there. Reason being: I want this to be as spoiler free as possible. This is a script you should read without knowing too much. After finishing Uprising I was exhausted, not from the reading itself, but because it made me realize just how much further I have to go, on a personal level as a screenwriter. Sure, Uprising is far from perfect, but when it comes to sheer entertainment on a commercial level, this script tops the cake. It ticks all the boxes - intriguing, gripping, horrific and funny - just an enjoyable read. I must admit I’m not entirely stoked over the chosen director, but Wolfgang does have an uncanny ability to do things on an epic scale – and although the bulk of Uprising takes place in and around the same location, it’s also an alien invasion movie. They need to be epic. They need to be big, global, bold and in your face. I just hope to God they make this film, and I hope to God they don’t change too much from the draft I read. So if the weekly barrage of alien specs is making you yawn, do yourself a favour, read Uprising. I highly recommend it. What I Learned: David Twohy rocks!